Unfortunately I couldn't make the November Club night so I', afraid I can't report anything. 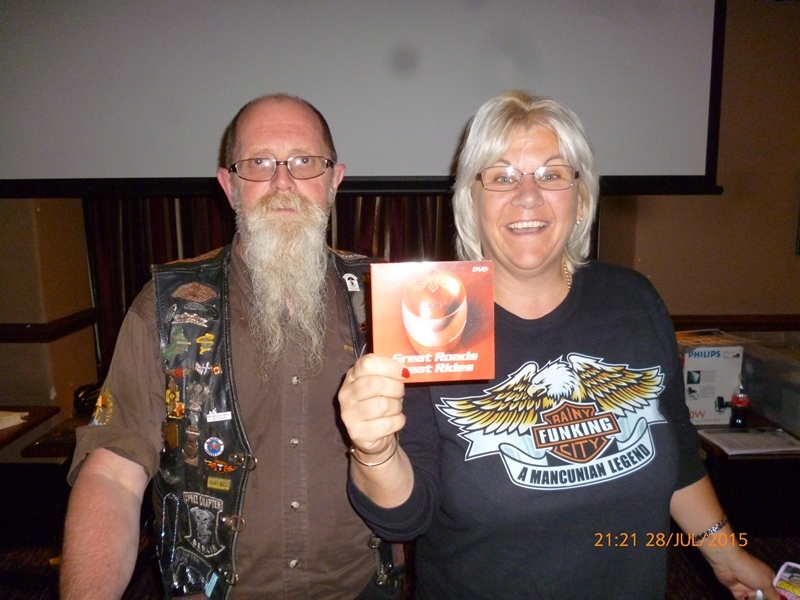 However our new roving photographer sent me the photo's of the raffle & quiz winners - so here they are. I don't believe it - Jeff wins just for a change. Adrian is happy with his prize. 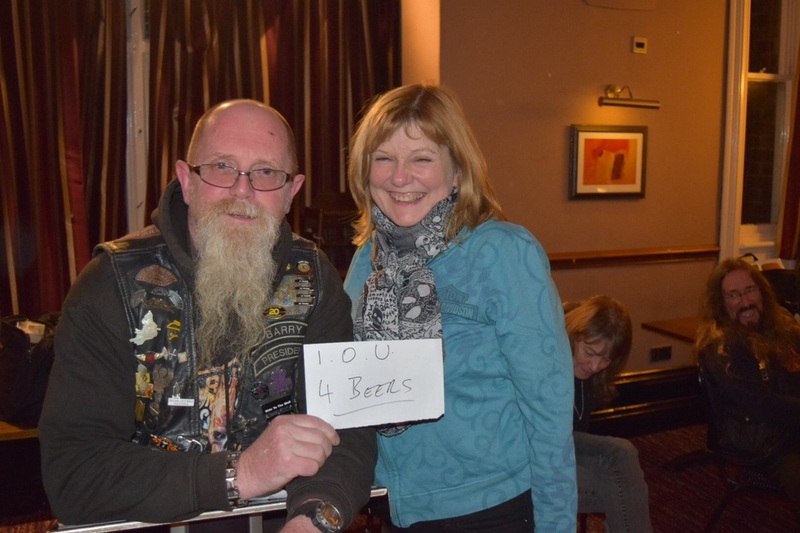 Jean's team won the quiz - Barry forgot the prize so its an iou...! 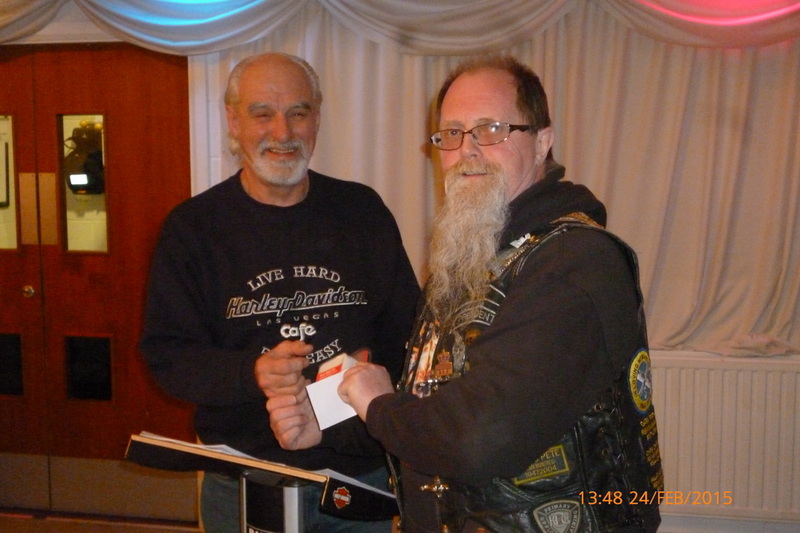 Ken picking up his 10 year membership pin. Don't forget there is no meeting in December however we will be getting together at the Hard Rock in the Print Works Manchester on the 29th Dec. If you fancy a beer or two earlier then a few of us will be meeting in Weatherspoon's in Piccadilly about 3:30 - 4:00pm see you there and have a Merry Christmas and a Happy New Year. It was that time again when all the nominations are in and the counting has been done. 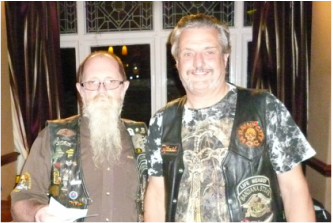 Yes it was the AGM, our first at the new venue. Quite a few members turned up for the night though not all - so where were you all its your club and your vote would have counted. Anyway here's a rundown of the night. 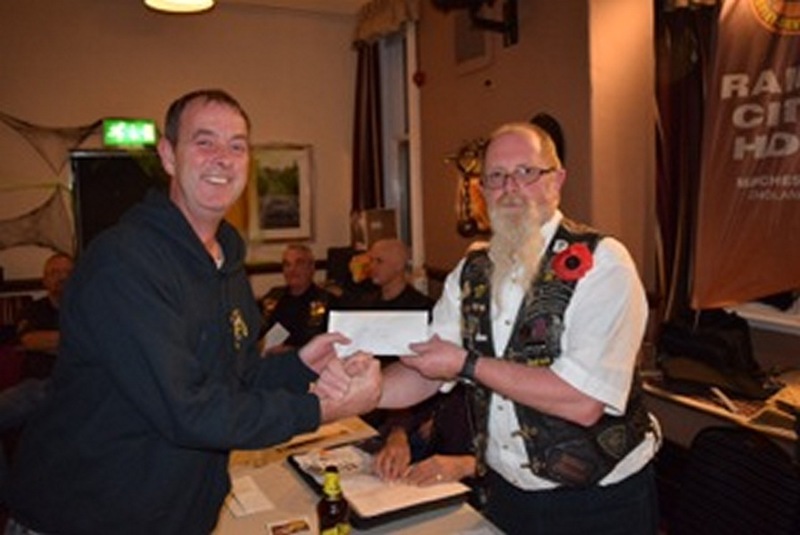 Monty for Rideouts, Mal for the events, Kev for Hogwash, Steve for the website, Chris for a safety report and finally Jon who presented the club accounts. 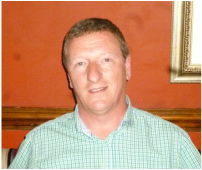 Jon reported on Rainy Daze 12 accounts, there were more people pre booked which made things easier this year. He thanked Mal for her efforts in handling other club monies. With the success of Rainy Daze this year we will be presenting a cheque of £250 to children in Need. Upto the AGM, 64 people have renewed their membership with many expected to renew in the next month - as is the norm. Rainy Daze will be going ahead at Bowdon Rugby Club on July 22-24th so keep your eyes peeled for the release of the tickets. Followng the reports Barry disbanded the current committee. The elections took place and your new committee is as follows. Mikey decided not to stand again this year, thanks for your time on the committee Mikey. ​See the Committee page for pics. 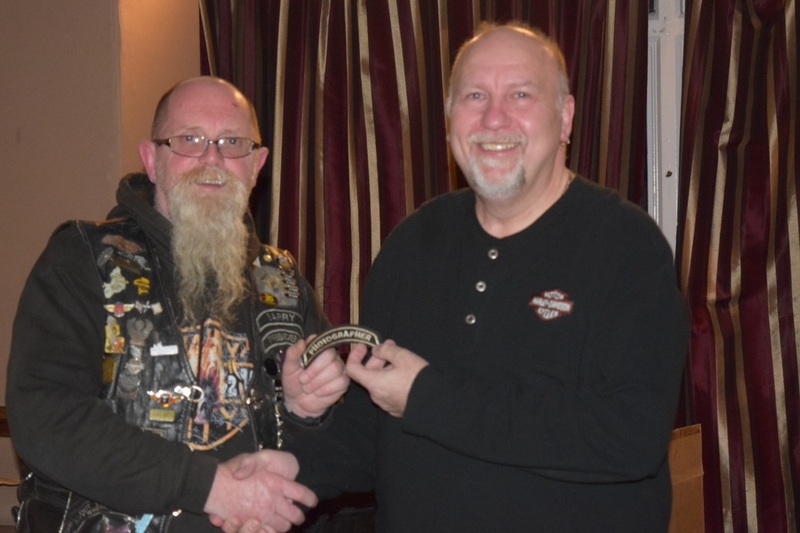 This brought us onto the member of the year award - awarded by Chris McDonald the award was introduced some 12 years ago in memory of Lawrence Millet who had the Harley Dealership that Rainy City came from. The winner as voted for by you the members. 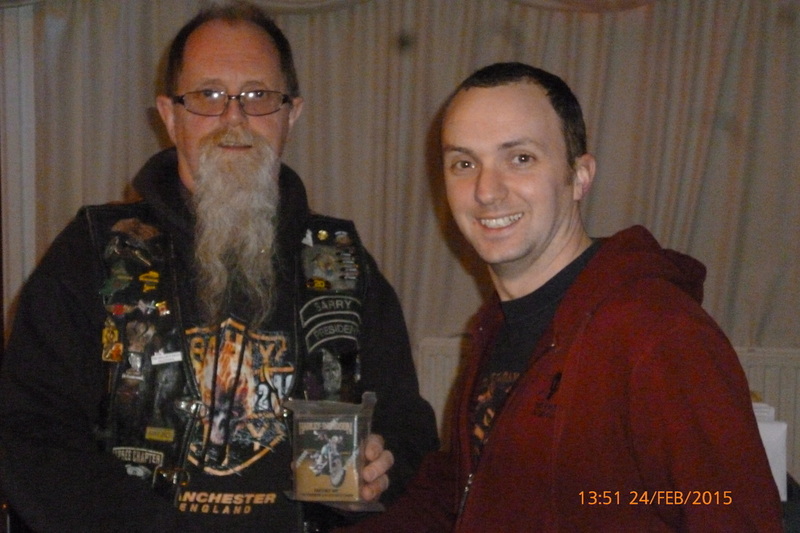 This year it was won by a first timer though he's not new to the club by any means, it's the one and only Kev Carroll. As most of you regular club night attendees know, when you attend a club night you're asked to 'sign in'. 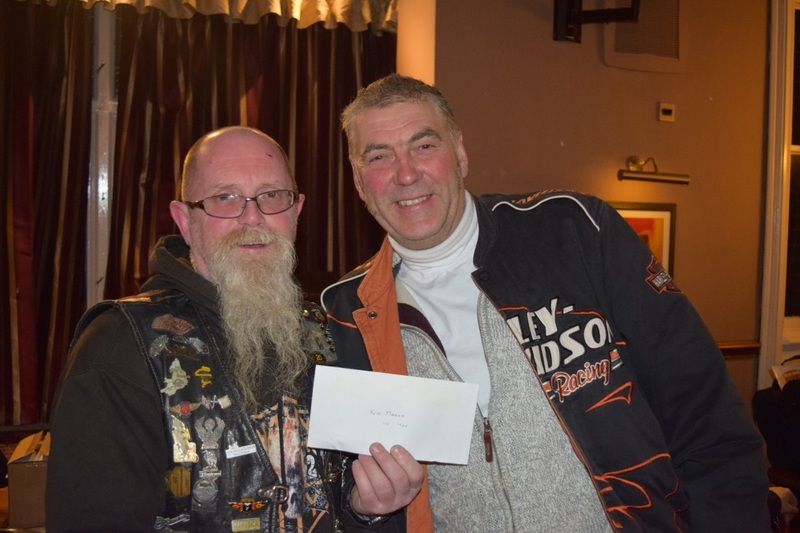 Each time you sign to say you've attended you are awarded a raffle ticket which goes into the members draw at each AGM and the owner of the raffle ticket that's drawn wins a prize. 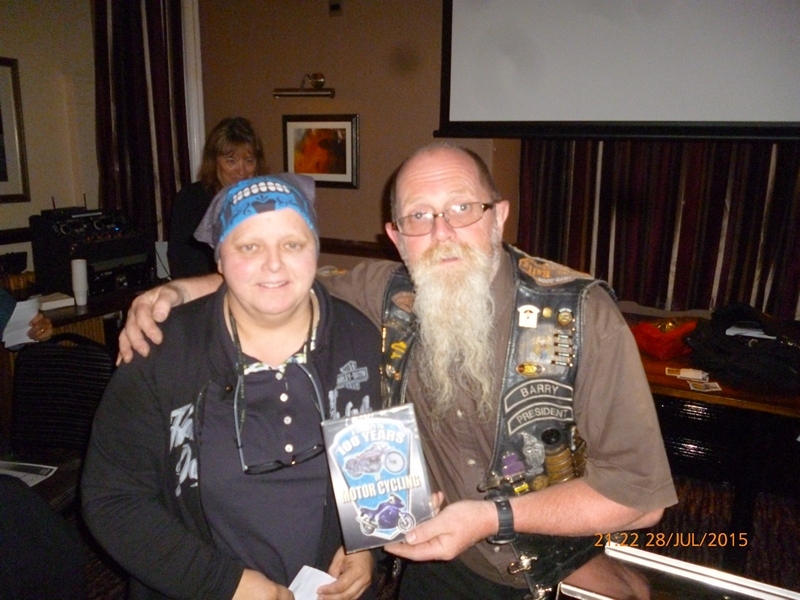 This year it was Carol Mason and the prize was a complete Harley Davidson cleaning kit, here she is receiving it. 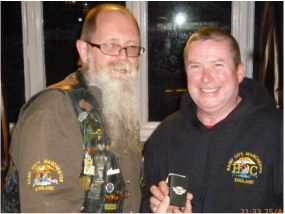 The year was also the anniversary of some members joining, here are the members receiving their year pins. First the 5 year anniversary. 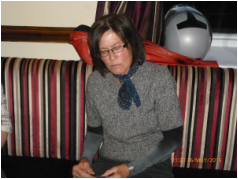 Patricia Harrison has been a member for 10 years, unfortunately Patricia wasn't there to collect her pin. Well thats it for another year, thanks to all those that attended. The venue is good and the food was great - I don't think there was much left. Well done to all those that went on the Gentleman's ride it seems to have been a success. Rainy City riders raised £1300 from 10 riders quite a percentage of the £10,500 total raised on the day, there are some photo's on Youles website. It's that time again and that time is AGM yep the next club night is the AGM, so get your voting slips in for member of the year asap please so we can get the trophy engraved in time. Also if you fancy being part of the team get your nominations in for committee places they're all up for grabs. Don't forget its free food so please let Barry know f you'll be there so we can order enough food. RTTW there are 495 bikes plus marshals booked in to leave Knutsford and 105 plus marshals from Sandbach services. That's a large number of bikes it should be a good one. The Rainy City xmas party needs to be booked soon as Mal has to give back the rooms that she has reserved so if you want a guaranteed rom for the night/s get the booking form back to Mal asap. Last year we didn't have a calendar as not enough people wanted them - that was until the deadline has passed, then you all wanted one..! so please get you ORDER in soon. 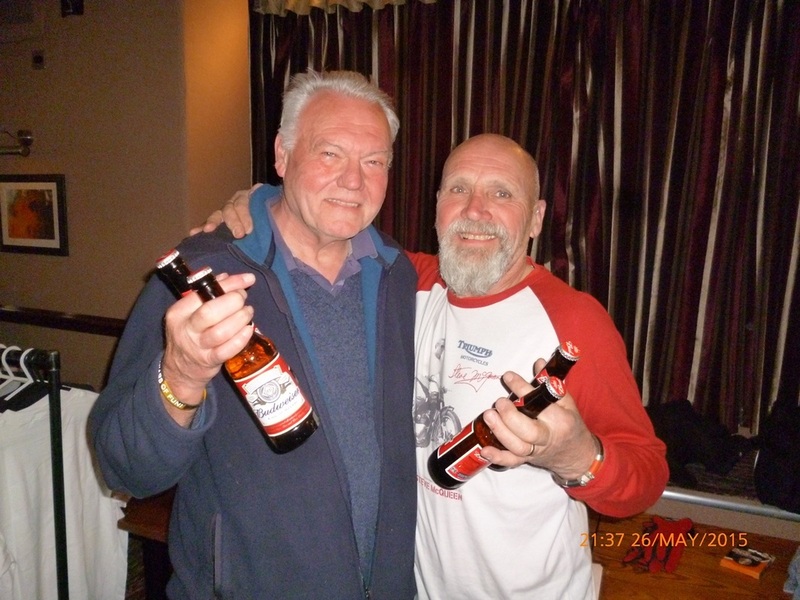 ​The Faaker See trip was a success and to show their gratitude on behalf of those that went Monty presented Barry with a bottle of Old Putney. One minor thing that came from the Faaker See trip was....well you work it out. 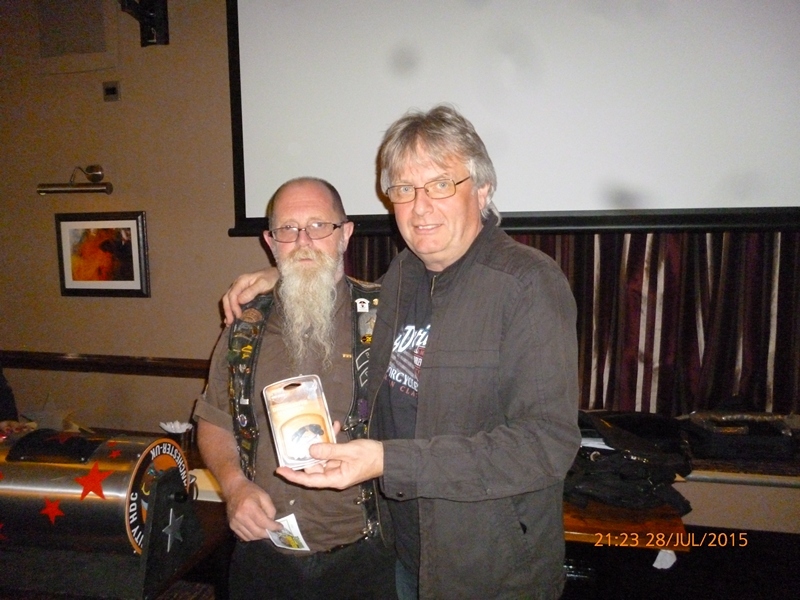 Here's a pic of Kevin making a presentation to Ian one of our new members - a piss taker. 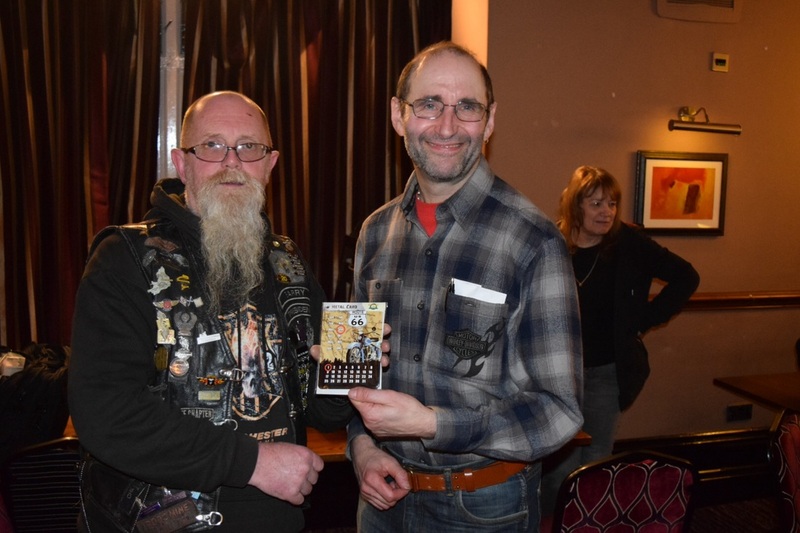 The quiz winners this month were new - winners to the quiz that is, just look who won. So on to the raffle winners. Ian seems to collecting prizes quite a lot. And Jeffs also a winner for a change. Mikey's a winner for a change. Next Club Night is the AGM on October 27th. How soon it comes round, were at the August club night this year seems to have flown. As you will all know the AGM is held at the October meeting, when you get your copy of Hogwash which was at club night for collection, you'll find the voting and nomination forms. They are out this early because Barry will be on the Faaker See trip when they would have normally been sent out. So have a think who you'd like to vote for as club member of the year and if you'd like to be part of the committee nominate yourself - just remember there is more to it than just a title! We have a new member and he's joining in already by going on the Faaker See trip - welcome to Ian Bottomley. Bandana(less) Steve was first winner. 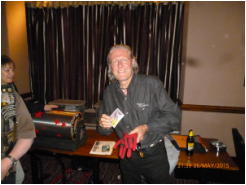 I think Martin must buy all the raffle tickets Mal has left - he wins all the time. An old favourite Tony with the fourth prize. Next Club Night is September 29th. Hi there, there's not much to report this month! probably because ist only a week and a half since Rainy Daze 12. I think that was one of the best yet if not the best, we had the music, the band, the people and yet again the weather held off till the late hours of Saturday night by which time we were all tucked up in bed. Take a look in the gallery for the pictures. A big thank you to everyone that took time out on Thursday to help us set up the rally all help is greatly appreciated. Also a big thanks to those that stayed behind on Sunday and helped with the take down, it was supposed to be getting easier but I still didn't get home until 6:30 on Sunday - oh well. 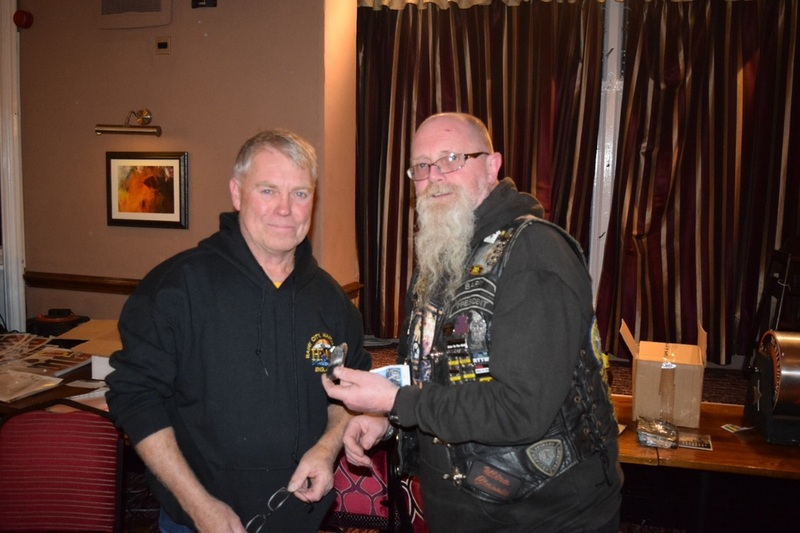 One of the awards that couldn't be made on the night at RD12 was best custom, Steve the winner couldn't stay around so late (should book a ticket and you can stay over next time) came along to collect his trophy. 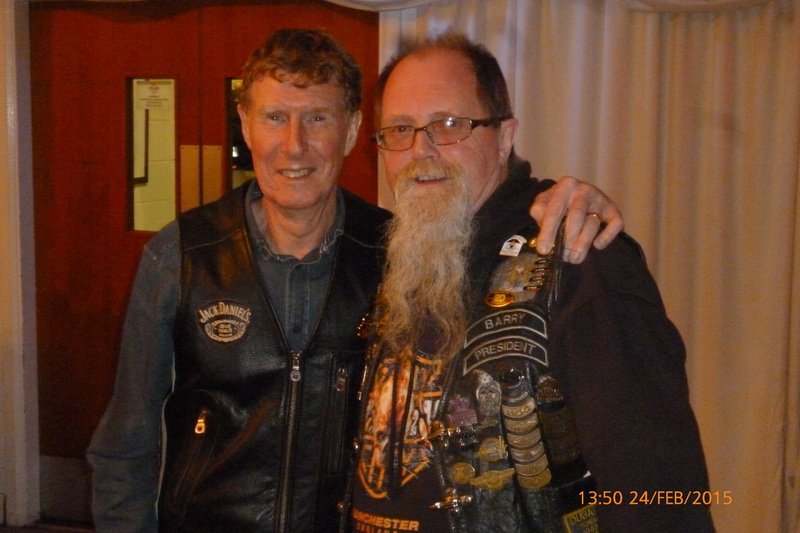 As there wasn't much news Barry gave a run down of the up and coming events and possible ride outs - see the Calendar page for events and ride-outs. Here's ? 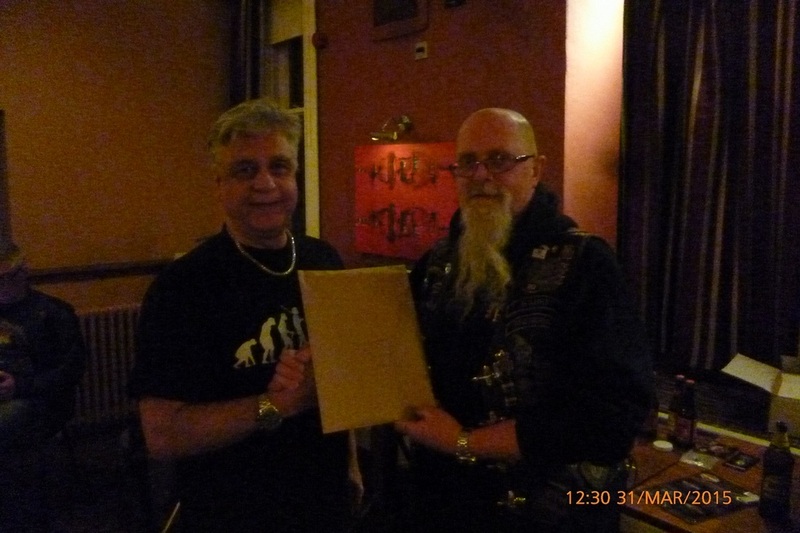 Sorry didn't get your name, collecting the quiz prize. And finally the raffle winners. Next Club Night is August 25th. Rainy Daze tickets, this is the last month that you can get them at the reduced rate..! get your tickets now the price goes up from £20 to £25 after 31st May. Well its almost upon us Rainy Daze - have you all got your tickets? if you haven't pre booked you'll be paying £25 to get in now there's been plenty of warning. 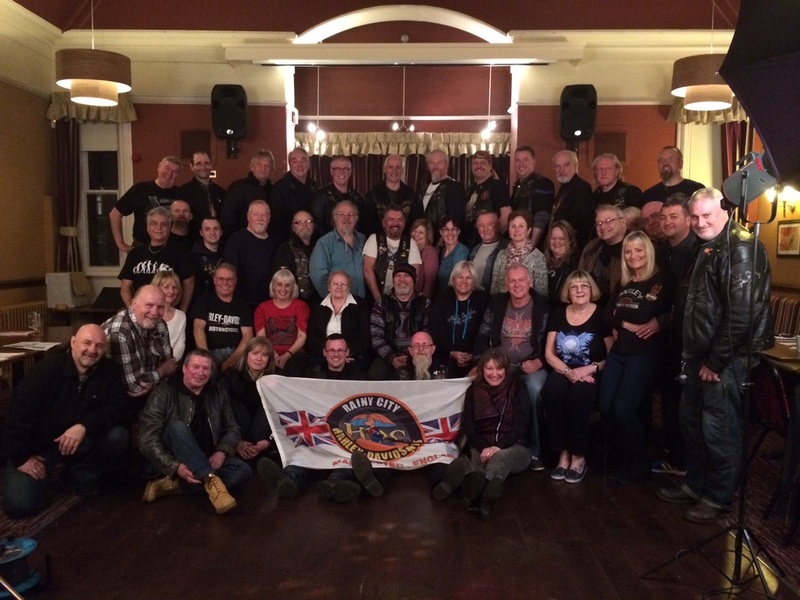 There has been a high number of pre booking this year maybe because of the pre booking discount or just maybe people are finally latching on to the fact that it is probably the best independent Harley rally there is. So far we have 94 pre booked thats 3 times the pre booked last year. As always your club needs you for setting up the rally site and for dismantling on Sunday, if you can help set up please be at the rugby club from 10:30 on Thursday 16th, or if you can ono help on Sunday just stay around instead of rushing off first thing we'll find you a job. You may have noticed that your latest copy of Hogwash doesn't have any flyers, due to the cost of printing and the additional postage that it incurs posting them with the mag from now on they will be emailed only, you can still down load them from this very website still. The Barton Air show is on this weekend so if your're putting your bike on the stand please be there before 8:30. 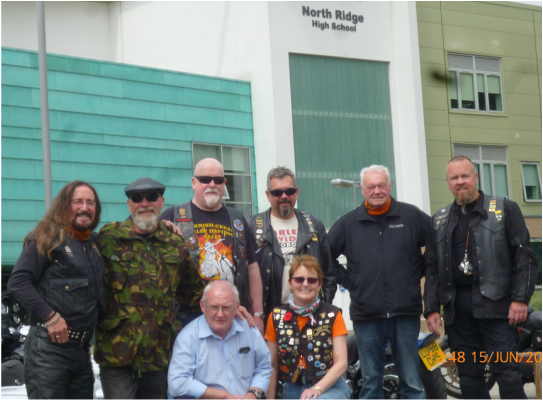 Last month we asked for volunteers to take a day out and go with there bikes to Northridge school in Blackley north Manchester. Northridge is a school for special needs children of varying degrees of disability, they asked if a couple of bikes could come along so the kids could have there photo taken with the bikes. Well 7 of us turned up Joy, Ken, Brian,Tony, Kev, Nick and yours truly, the kids loved it those that could sitting on the bikes for the photo. According to the head teacher they were talking about it all day - a big thanks to all that turned up. While we were there Chris the head teacher gave us a tour of the school and mighty impressive it is. We had a thought also while we were there, that it would be good to support the school as a club charity. While they have lots of facilities they still need help with various projects. Chris advised that one of the project they need help with is a garden of remembrance - not a sad place but a place that happy where children parents & teachers can go and remember the times with the children - these children don't always out live the adults. We'll keep you informed to the type of help they need, it might be fund raising or manual help. 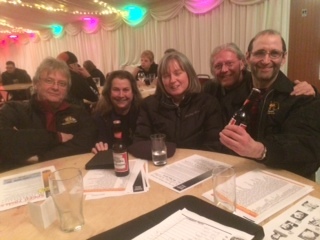 The quiz winners this months were Monty, Jeff, Martin & Judith. 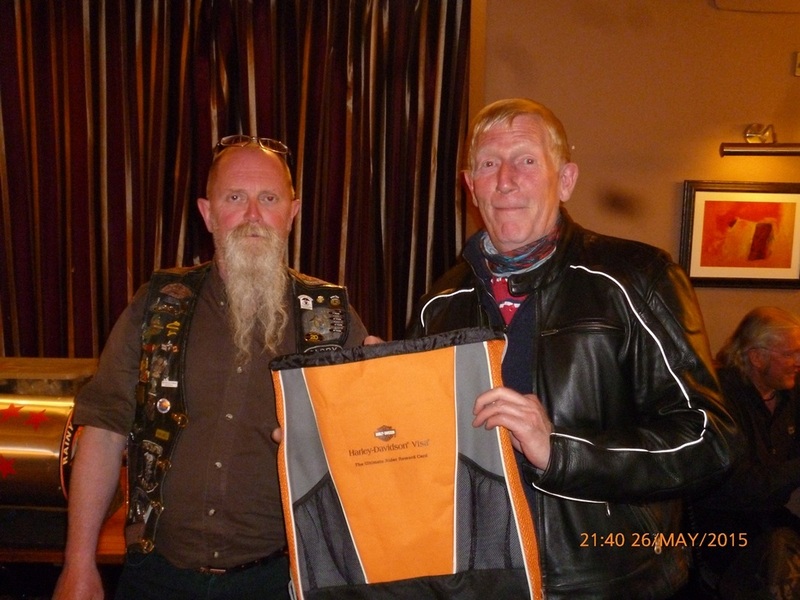 And yet another regular raffle winner Martin. Next Club Night is July 28th. A good turn out tonight with quite a few turning up on bikes, that's always good to see. A little quiet on the news front this month. We had a request from a teacher from Northridge school, a school for special needs pupils asking if we could help out with a photo shoot. When the students leave the school try and make it an occasion of it by asking various clubs to help with the photo shoot. Last year they had a WW2 jeep an previously the local Ferrari Garage brought along a new Ferrari. We had 6 volunteers for the occasion which is great guys thanks. We also need around 12 bikes for the Manchester Air Show, we were approached by the organisers to see if we could put on a stand. For those that went to the Manchester bike show back in March it will be along those lines. Turn up in the morning and leave your bike on the stand till the closer of the show. Please let Barry know if you'll put your bike in the show. The club trip to Faaker see is being organised now if you want to go let Barry know by Friday the 5th June at the latest or there will be no guarantee that you will be on the campsite...! you've been warned. 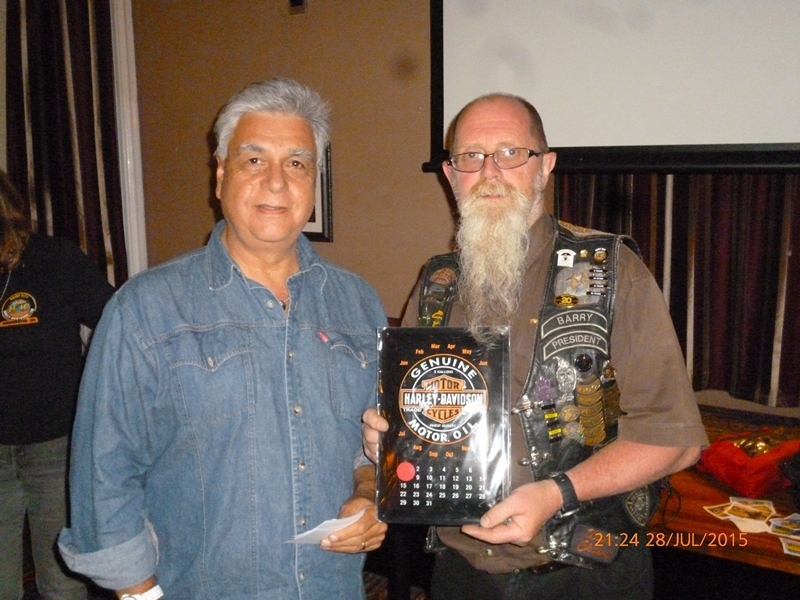 This months quiz winners were Brian, Nobby, Tony & Jeff. 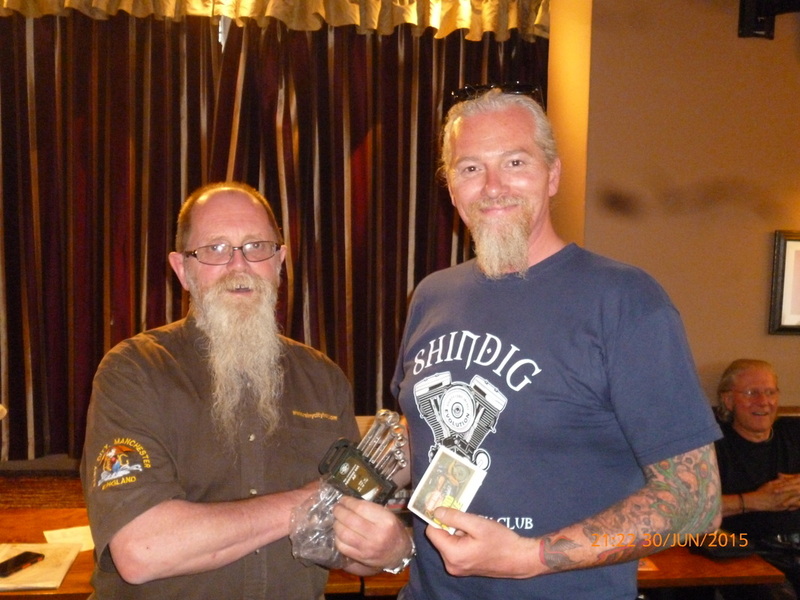 Here's Brian collecting the prize. Some swapping of raffle prizes me thinks. Next Club Night is June 30th. The second meeting in our new home seemed to go well! I think everyone is used to the idea now and I don't think anyone has got lost - yet. There wasn't a lot to report this month for those going on the Kuture Cruise its meet at Knutsford services at 9:30 for a 10am leave. For those going to the Wallace, if you'd like to travel up together Helen, myself, Dave & Lizzie will be meeting at Lymm truck stop (jct. 20 M6) at 8:30am on Thursday 14th morning. We'll have some breakfast then leave when we're ready. The Super Rally follows the Wallace, if you want to travel down during the week making a holiday of it Gunlaw (band that play at the Wallace) have arranged a stop over at Squires Cafe - Sherburn in Elmet, West Yorks, LS25 5LX where there is food & camping available for £5 per pitch with all proceeds going to Guide dogs for the blind. You should by now have received a flyer for Faaker See with a booking form attached - if not look on the events page and if you want to go please get the booking form off to Barry asap. He needs to know how many are interested it also help with getting prices, the more that go the cheaper it is. A note to remember the SOFER rally is at Hickstead not Bisley this year. Not bad Ian! Joined last month and already a winner - joined the right club. Adrian is that a picture of you or the new bike? Nice one Andy, I think you've won before. Bedtime reading Ken - what will Margaret say? he wasn't in the winning team - again, he just wants to be in a photo. Next Club Night is May 26th. Well we're homeless no more, our first club night at our new home I think we can all say it was a success. Heres a picture to prove it. For those of you that went to the bike show at Event City won't it a great show? Thanks to those members tat took time out to help the set up on Friday manned the stand on either Saturday or Sunday and of course the packing up on Sunday. A special thanks to those who volunteered their bikes for the stand. 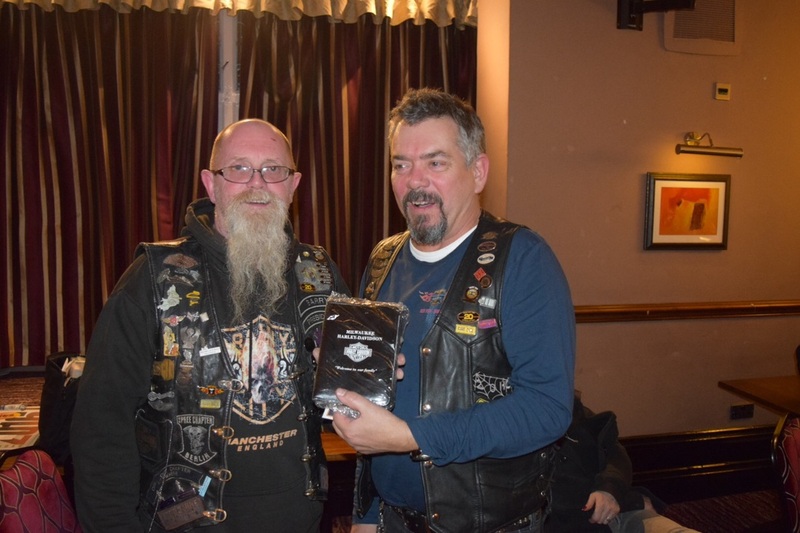 Not only was i a good show Rainy City members won two prizes Nick Jackson won best Chrome for his Dyna and Kev Carroll won best Harley for his Fat Boy, see pics from the show here. Also at the show we had a competition - to guess how many nuts Jon had....in his tank! Jon cut a petrol tank in half and filled it with nuts as in nuts & bolts not the nuts that squirrels eat. The closes guess won 2 tickets to Rainy Daze 12, as Jon was the only one that knew how many there were the competition was open to everyone. The total in the tank was 3163, the nearest guess was a member of the public Mr Steve Moss with a guess of 3149. The nearest Rainy City member was Helen (your club secretary) with a guess of 3245 - Helen won a bottle of wine donated by Jon. For those of you that still didn't know the tickets for Rainy Daze are on sale now! So far we have sold more tickets abroad than we have here get your tickets now the price goes up from £20 to £25 after 31st May. The club trip to Faaker See, Barry is working on it now so please if you are interested in going register your interest with Barry asap, it will help in reducing the price plus where he can get the accommodation for the trip out and on the return leg. The Super Rally which follows the Wallace Gunlaw the band are putting on a camping night for £5 details I guess will be on their website. 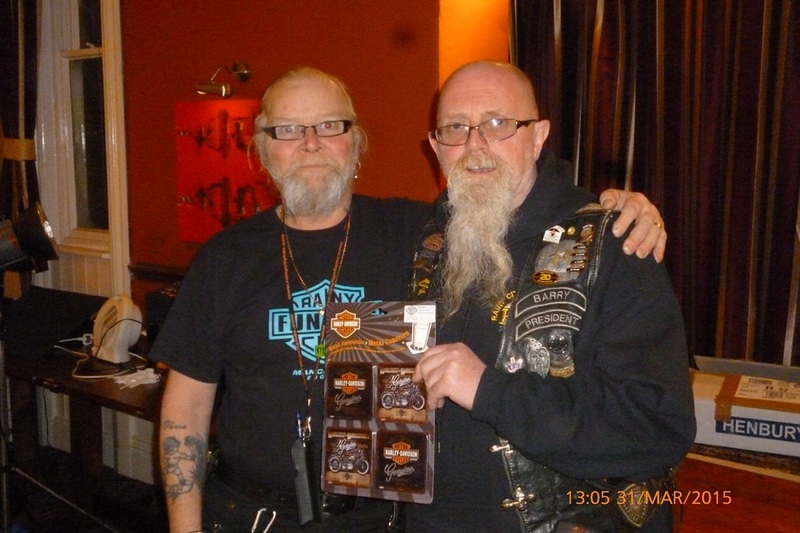 The Run To The Wall (RTTW) tickets went on sale the weekend of the Manchester bike show and in 13 hrs all ticket for the Drayton Manor start were sold out..wow! so far there are 2000 bikes registered for the event. 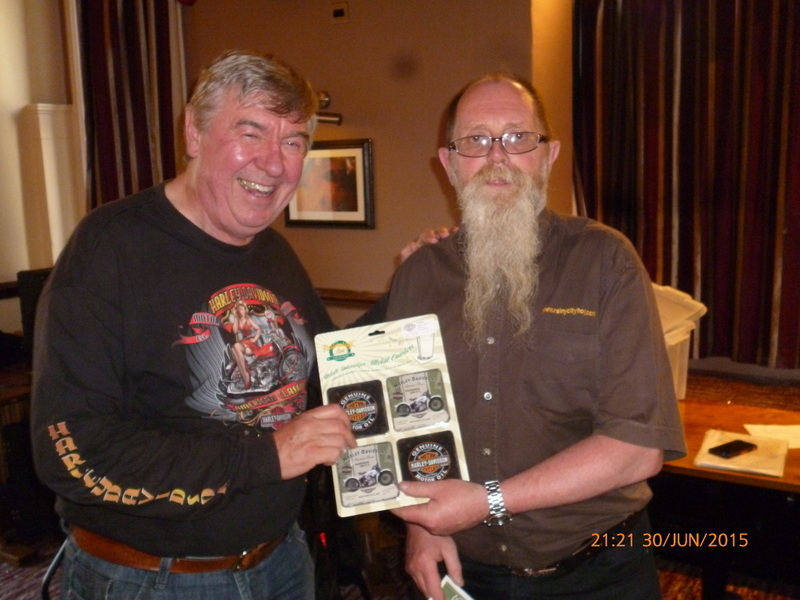 Norman out 007 lookalike was presented with a special gift some 007 cufflinks that Kev had come across on one of his travels. Next Club Night is April 28th. 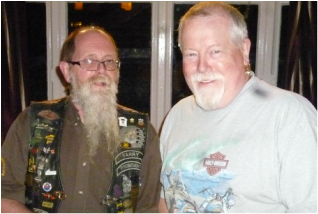 Homeless for a second month so we had club night at Bowdon rugby club again. This was the last time though as we have now found a new venue. 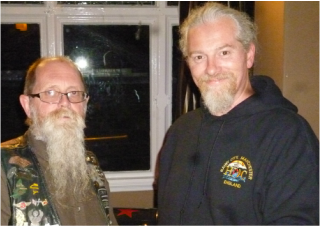 For those that made it to club night you'll have heard already, so for the March meeting we'll be at The Moorfield, Marsland Road, Sale, M33 3NW. Check the meeting page for directions and a map. For the next meeting we are going to get samples of the merchandise to display, these being a Hoodie, Sweat Top and a Fleece. We'll only be getting one of each so you can see what they're like. Please bear in mind that these items are to order only - see the shop page for prices. Due to the massive response to the request for and Tour t-shirt Kev has decided to extend the cutoff date so get your entries in - NOW. The Manchester Bike show is looming and we still need your bike to fill the stand, we have space for about 12 bikes. Please let Jon know if you'll enter your bike, send your details and some details of the bike to. 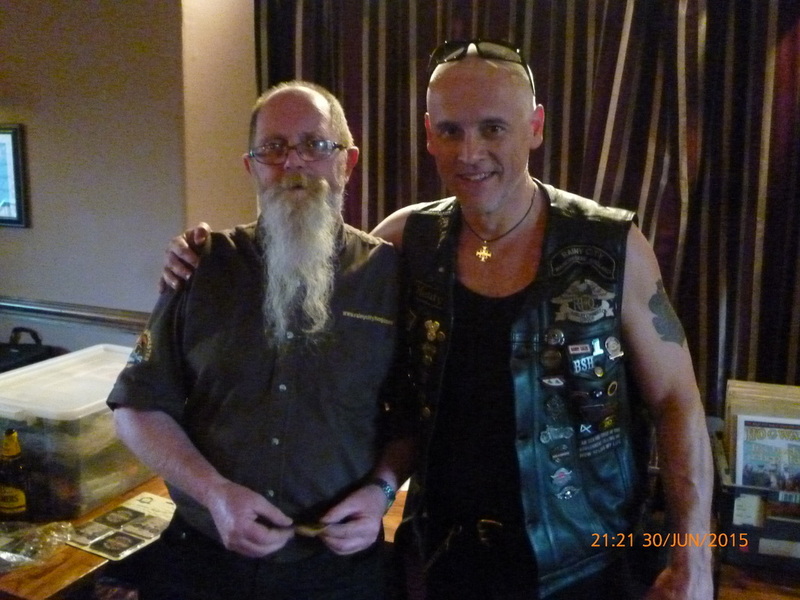 For the 2015 club ride to Faaker See, Barry will be starting work on planning proper by the end of March so if you're interested in going on this trip please let Barry know. It will help with the coatings if he has an idea of numbers before he starts the planning process. Tonight we had an award presentation. Way back in Sept 14 one of our lady members completed and passed the I.A.M training course, here she is recieving her award. Well done Gillian Cox - now a trained rider. 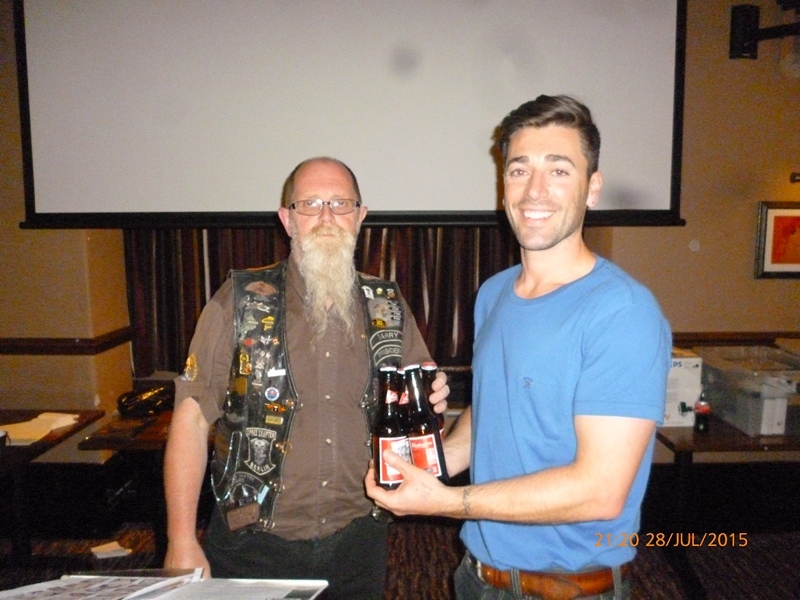 Following the presentation we had the raffle and some familiar faces. Still collecting Raffle prizes David? Its a while since we had a news winner it's Stewart. 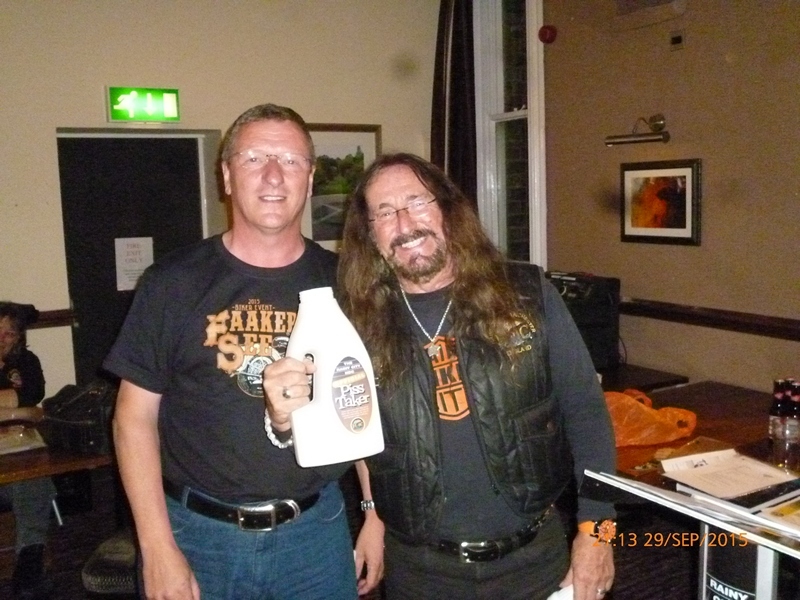 And finally the Quiz - here's Brian collecting the booze. Next Club Night is March 31st. ﻿Well it was all change for the first meeting of the new year, we had to hold the first meeting at Bowdon rugby club. Most of you will now know that The Brown Cow closed its doors for the last time over the Christmas & New Year period - we think to become a housing development. So that leaves us temporarily homeless. If anyone knows of a pub with a function room (free of charge) that's separate from the main pub area and also serves food and has a decent car park please let anyone of the committee know - it's going to be difficult with the number of pubs closing down. We've decided that we need a new design for the club tour t-shirt so for all those budding artists out there please put pen/pencil to paper and get sketching and send all your designs to Kev. See the promo flyer here. If you want to go on the Kulture Kruize please let Barry know asap. He needs to confirm the numbers for booking the accommodation. An old event that seemed to disappear has returned again for 2015. The Heart & Soul is back and it's now moved venue from Gosforth in November to North Shields in August. Check out the events page in the calendar. Mick, Vanessa, Sharon, Jon & Adrian. Carol won the first prize of the year. There's a suprise! Chris winning. 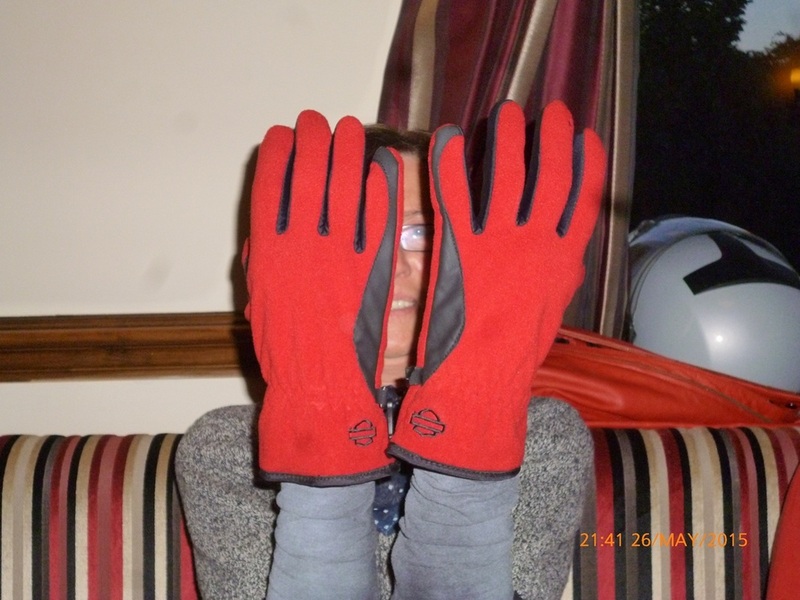 Well third raffle prize was Jeff - sorry Jeff I haven't a photo....! so here's an old one. Next Club Night is February 24th.